The finals of the Brigade’s National Competitions take place between March and May each year, and we are pleased to share with you the results of the finals for the 2017-2018 session. 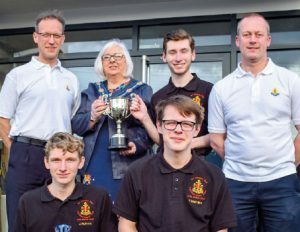 Congratulations to 1st Cheslyn Hay (England) winners of the National Chess competition. The 1st Glenwherry (Northern Ireland) took the runners-up spot at the event which took place at the NI Headquarters, Newport on Saturday 24 March 2018. Well done to our other finalists 1st Ardstraw (Northern Ireland) and 6/8th Dundee (Scotland). The teams took a welcome break at lunch time to have a walk around nearby historical Hillsborough to take in the sights and sunshine before heading back to the final round. Deputy Mayor Hazel Legge visited the competition in the afternoon and presented the prizes at the end. The teams and leaders from 1st Cheslyn Hay and 6/8 Dundee also had the privilege of being the first guests to stay in the new Residential Centre at the NI District Headquarters Newport. 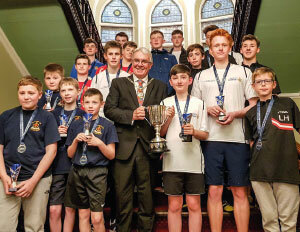 Members of 1st Monifeith (Scotland) won the National Table Tennis title at the competition finals which took place in Inverness on Saturday 5th May. 1st Monifieth has reached the finals before, but this is the very first time that the Company has won the competition. The team, Jordan Ednie, Mackenzie Rough and Duncan Fulton, progressed through regional heats to reach the national finals. Also competing in the finals were teams from 44th Glasgow (Scotland), 4th Southampton (England), 1st Kempston (England), 2nd Coleraine (Northern Ireland) and 1st Greenisland (Northern Ireland). The event was organised and hosted by Highland Battalion and we were pleased to welcome Cllr Graham Ross, Deputy Provost of Inverness, who met the finalists and also presented the competition trophy to the winners. Three wins, a draw, and one defeat in five matches saw the Company finish at the top of the group, but level on points with 2nd Tonbridge Company. A ‘winner takes all’ play-off game was then required to separate the two teams. Despite the team from Tonbridge putting up a brave fight, the South Shields players were not to be denied and ran out 2-0 winners. Second-half goals from Captain Jordan Brindle and Harry Edwardson sealing the result and sparking celebrations amongst the travelling supporters. The runners-up were 2nd Tonbridge (England); and other teams reaching the finals in Newtonabbey were 1st Buckie (Scotland), 6th/8th Dundee (Scotland), 7th Portadown (Northern Ireland) and 1st Knocknamuckley (Northern Ireland). After the presentation of the trophy by Brigade Secretary, Bill Stevenson, the players attended a lunch hosted by the Mayor Paul Hamill. The 1st Moneymore (Northern Ireland) made history on Saturday 12th May at Power League in Derby by winning their first Junior 5-a-Side Football title. In what turned out to be a very competitive day, it came down to the very last match before the destination of this session’s title was known. In the final match, 1st Moneymore narrowly beat 4th/5th Kilmarnock, and in turn, beat 14th West Bromwich to the title. The runners-up were 14th West Bromwich (England); the other finalists were 4th/5th Kilmarnock (Scotland), 6th/8th Dundee (Scotland), 5th Carrickfergus (Northern Ireland) and 4th Southampton (England). The finalists were welcomed by Jaime Ellis, President of East Midland District. The winning team of Lee McMenemy, Matthew McMenemy, Travis Harkness, Lewis Francis, Glenn Caldwell, Curtis Neill and Luke Marks were presented their individual trophies and medals by Paul Haggan and Leigh Maydew, Members of England Regional committee. 1st Moneymore Team Captain Lewis Francis said “It was a great event and a privilege to play and to Captain this team. Nobody let the team down and travelling to Derby to participate made the experience even more exciting and rewarding." On arrival back in Moneymore, the team received a reception from members of the public on the main street, who came out to offer their warmest congratulations to the boys and coaches for their unprecedented success. The 1st Bearsden Company has made it two in a row, being crowned national champions for the second year running at the Masterteam Finals. Teams from all regions came together in Liverpool for the finals at All Saints’ Church in Childwall. The winning team comprised of Lyle Hamilton , Fergus Hempel, Fraser Ellis and Ross Brown. The team was presented with their medals and the championship trophy by Bill Stevenson, Brigade Secretary. The runners-up were 1st Ardstraw (Northern Ireland); other finalists were 1st Polmont (Scotland), 2nd Llantwit Major (Wales), 1st Cheslyn Hay (England) and 4th Newtownabbey (Northern Ireland). The event was organised by Liverpool Battalion and the teams were welcomed to the city by The Right Worshipful Lord Mayor of Liverpool, Councillor Malcolm Kennedy. 1st Houston (Scotland) have been crowned National Badminton Champions at the Finals held in at SportScotland’s National Sports Training Centre in Largs, North Ayrshire on Saturday 21st April 2018. The winning team comprised of Ewan Harvie, Justin Langan, Jonathan Paris and Christopher Torrance. The team were presented with their medals and the championship trophy by Provost of North Ayrshire Council, Councillor Ian Clarkson. The runners-up were 4th Newtwonabbey (Northern Ireland); the other finalists were 1st Crowborough (England). 32nd Nottingham (England), 1st Granshaw (Northern Ireland) and 1st Largs (Scotland).